Two hands and Two feet. Several times my daughter had telephoned to say. "Mother, you must come and see the daffodils before they are over." I wanted to go, but it was a two-hour drive from Laguna to Lake Arrowhead. Going and coming took most of a day--and I honestly did not have a free day until the following week. "I will come next Tuesday, " I promised, a little reluctantly, on her third call. Next Tuesday dawned cold and rainy. Still, I had promised, and so I drove the length of Route 91, continued on I-215, and finally turned onto Route 18 and began to drive up the mountain highway. The tops of the mountains were sheathed in clouds, and I had gone only a few miles when the road was completely covered with a wet, gray blanket of fog. I slowed to a crawl, my heart pounding. The road becomes narrow and winding toward the top of the mountain. As I executed the hazardous turns at a snail's pace, I was praying to reach the turnoff at Blue Jay that would signify I had arrived. When I finally walked into Carolyn's house and hugged and greeted my grandchildren I said, "Forget the daffodils, Carolyn! The road is invisible in the clouds and fog, and there is nothing in the world except you and these darling children that I want to see bad enough to drive another inch!" My daughter smiled calmly," We drive in this all the time, Mother." "Well, you won't get me back on the road until it clears--and then I'm heading for home!" I assured her. "Carolyn," I said sternly, trying to sound as if I was still the mother and in charge of the situation, "please turn around. There is nothing in the world that I want to see enough to drive on this road in this weather." And so my sweet, darling daughter who had never given me a minute of difficulty in her whole life was suddenly in charge -- and she was kidnapping me! I couldn't believe it. Like it or not, I was on the way to see some ridiculous daffodils -- driving through the thick, gray silence of the mist-wrapped mountaintop at what I thought was risk to life and limb. On the far side of the church I saw a pine-needle-covered path, with towering evergreens and manzanita bushes and an inconspicuous, hand-lettered sign "Daffodil Garden." Live oaks, mountain laurel, shrubs, and bushes clustered in the folds, and in the gray, drizzling air, the green foliage looked dark and monochromatic. I shivered. Then we turned a corner of the path, and I looked up and gasped. Before me lay the most glorious sight, unexpectedly and completely splendid. It looked as though someone had taken a great vat of gold and poured it down over the mountain peak and slopes where it had run into every crevice and over every rise. 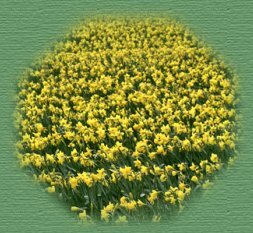 Even in the mist-filled air, the mountainside was radiant, clothed in massive drifts and waterfalls of daffodils. The flowers were planted in majestic, swirling patterns, great ribbons and swaths of deep orange, white, lemon yellow, salmon pink, saffron, and butter yellow. Each different-colored variety ( I learned later that there were more than thirty-five varieties of daffodils in the vast display) was planted as a group so that it swirled and flowed like its own river with its own unique hue. In the center of this incredible and dazzling display of gold, a great cascade of purple grape hyacinth flowed down like a waterfall of blossoms framed in its own rock-lined basin, weaving through the brilliant daffodils. As though this were not magnificence enough, Mother Nature had to add her own grace note -- above the daffodils, a bevy of western bluebirds flitted and darted, flashing their brilliance. These charming little birds are the color of sapphires with breasts of magenta red. As they dance in the air, their colors are truly like jewels above the blowing, glowing daffodils. The effect was spectacular. Five acres of flowers! (This too I discovered later when some of my questions were answered.) "But who has done this?" I asked Carolyn. I was overflowing with gratitude that she brought me -- even against my will. This was a once-in-a-lifetime experience. We walked up to the house, my mind buzzing with questions. On the patio we saw a poster. " Answers to the Questions I Know You Are Asking" was the headline. The first answer was a simple one. "50,000 bulbs," it read. The second answer was, "One at a time, by one woman, two hands, two feet, and very little brain." The third answer was, "Began in 1958." For me that moment was a life-changing experience. I thought of this woman whom I had never met, who, more than thirty-five years before, had begun -- one bulb at a time -- to bring her vision of beauty and joy to an obscure mountain top. One bulb at a time. There was no other way to do it. One bulb at a time. No shortcuts -- simply loving the slow process of planting. Loving the work as it unfolded. The principle her daffodil garden taught is one of the greatest principle of celebration: learning to move toward our goals and desires one step at a time -- often just one baby-step at a time -- learning to love the doing, learning to use the accumulation of time. "Carolyn," I said that morning on the top of the mountain as we left the haven of daffodils, our minds and hearts still bathed and bemused by the splendors we had seen, "it's as though that remarkable woman has needle-pointed the earth! Decorated it. Just think of it, she planted every single bulb for more than thirty years. One bulb at a time! And that's the only way this garden could be created. Every individual bulb had to be planted. There was no way of short-circuiting that process. Five acres of blooms. That magnificent cascade of hyacinth! All, all, just one bulb at a time." It is pointless to think of the lost hours of yesterdays. The way to make learning a lesson a celebration instead of a cause for regret is to only ask, "How can I put this to use tomorrow?